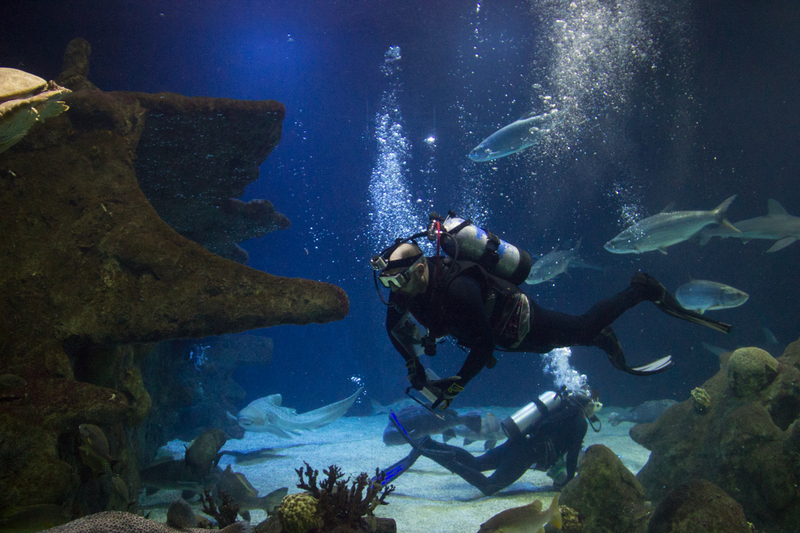 ABQ BioPark aquarist swims with the sharks, trains sea turtles. "It's a dream job—the hardest part is the weekend because you want to come back." Dan Anderson, aquarist at the ABQ BioPark Aquarium, literally has no complaints about his job. A life-long swimmer and diver, he has been an aquarist for a little over a year, but this is something he's strived for his whole life. And this "dream job" lets him target train sea turtles and swim with 22 sharks every day. 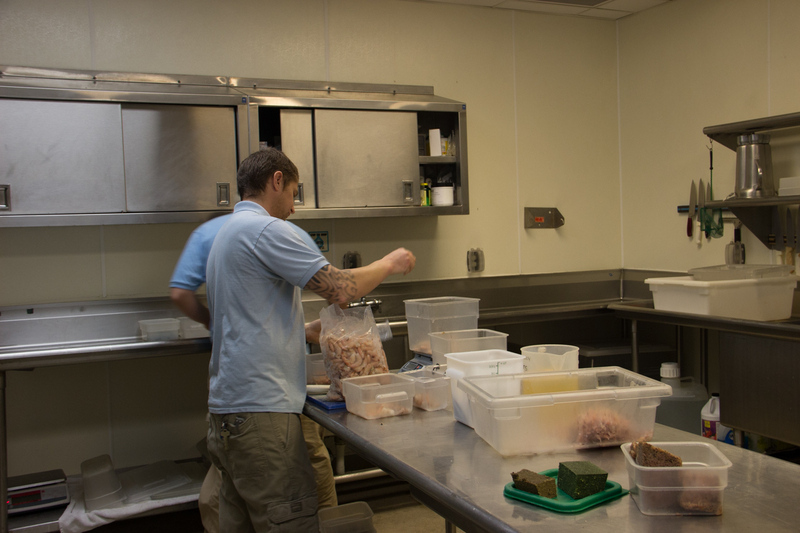 Work starts at 8 a.m. for Anderson—this is when he and a coworker start prepping food for the aquarium's tank-dwelling residents. The two are at a steel table, cutting fish. A radio softly plays rock music as they cut portions and fill small plastic tubs with fish, krill, squid and vitamin cubes. This is no easy task—the animals require diverse diets and all of the food must be cut and weighed. Anderson takes care when he's portioning the food—if the cuts are too small the animals might not get their fill, but if they're too big they could choke. And the Aquarium doesn't skimp on the shrimp when feeding its residents—everything here is restaurant grade. "Everyone here gets the best treatment and the best food," Anderson says. The crew has a few hundred mouths to feed daily, and goes through 100-150 pounds of food each day. Add roughly 30 pounds to that number on shark feed days, which happen four times a week. In all, food preparation takes about 1-1.5 hours each morning—longer on shark feeding days. Once the food is ready, it's time to start feeding. Aquarist Damien Spencer throws some food into the tanks, which trickles down to the animals like (tasty) rain from above. Other animals are hand-fed by Anderson and Spencer, who dive daily into each of the Aquarium's tanks. Today is one of the four days this week Anderson will feed the sharks. 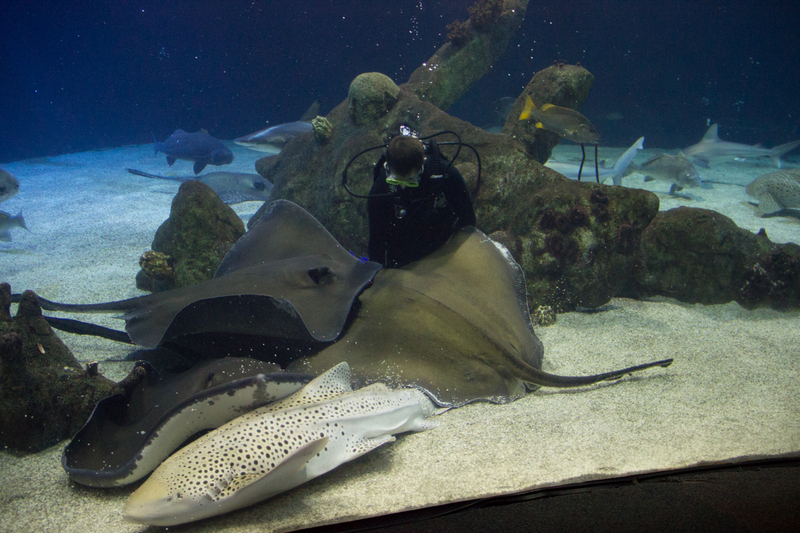 Although they'll dive into the ocean tank later in the day to hand-feed some of the animals, that is not an option for sharks—aquarists don't want these marine predators to associate food with humans. Anderson pulls out a long steel pole with two prongs on the end. He approaches a cart he just wheeled over to the top of the ocean tank and loads a fish onto the prongs. He then carefully lowers the pole into the water—at this point the sharks are circling around, ready to eat. Anderson feeds each shark individually, making sure he doesn't inadvertently fan the flames of aggression by allowing two sharks to pursue the same fish. Anderson knows each shark based on its behavior and physical characteristics and keeps track of who is eating what. For instance, he points out, the shark they refer to as "#5" has a small tell-tale notch on her first dorsal fin. Although some of the sharks try to get more than their fair share, the tank is oddly calm during feeding—they seem to know they'll each get their turn. "There's a lot of joy working with different personalities," Anderson says. "We have 22 sharks in the tank, but they all get along." Some individuals attempt to beg for seconds or steal a fish from another tank mate, but Anderson carefully keeps an eye on this behavior and thwarts conflicts before they happen. He also keeps a watchful eye on anyone who isn't eating—although some of the animals are shy, everyone should eventually come to eat. If not, an animal could be sick. The biggest thrill for Anderson is swimming in the Ocean Tank. "As you move around, the animals move with you and that's the most rewarding experience." His duties here include hand feeding eels and rays, target training sea turtles, and cleaning. It all takes about an hour. As Anderson and Spencer enter the tank, they swim over to the eels, who hang out under rocks near the Shark Reef Café viewing window. Click click click… Spencer taps a pair of tongs on one of the eels' hideouts to announce lunchtime—eels are masters at concealing themselves, but will come out to eat when hunger calls. Anderson and Spencer hand feed the eels with tongs. One of the tank's sharks doesn't seem to be satisfied with its earlier lunch, because it keeps meddling in the eel feeding. Spencer calmly removes this shark from the area a number of times so he can continue to feed the eels. Next, the two make their way to the rays, food containers in hand. The rays float over to the men—almost sitting on their laps—and get hand fed. Some stray pieces of shrimp occasionally float out from under the rays, and these treats are scooped up by opportunists, who are circling the area—sea turtles, other fish and sharks are part of this food-stealing posse. One smaller fish even attempts to get in on the action until it realizes the runaway food is as big as he is. The rays seem to love the attention, and the men even dole out some strokes on the "back." Next up is turtles, which seem to thrive on attention. The swimmers use poles with colored shapes adhered to the end to target train these ancient reptiles. If the turtles touch the shape (either a blue circle or a yellow triangle) with their head, they earn a squid treat—Anderson said this is an important enrichment activity for turtles. The turtles also get a neck massage—one of them even extends its head out to get more affection. Once Anderson and Spencer bring out the cleaning supplies and start scrubbing algae from the tank's surfaces, most of the animals return to swimming around the tank, ignoring the divers. Although the aquarium's residents don't seem to care much about this task, cleaning is a very important part of the pair's daily dive. Many people would have reservations about swimming in a tank with 22 sharks, but Anderson describes the experience as "very peaceful" and says of his big tank swims, "You are a guest in their home, and the animals can sense that respect." One of the more important aspects of Anderson's job is keeping an eye on who eats and who doesn't. He recognizes individual animals and keeps an eye on them every day, monitoring any unusual behavior such as avoiding food. This helps staff attend to any possible ailments among its tank dwellers. He also helps protect new tank residents by introducing them slowly via a "howdy" cage. Staff lower the new animal into the tank in this plastic enclosure. Anderson and his colleagues keep an eye on how other tank residents react to their new neighbor. If the animals express a lot of interest in the new guy in town, this could indicate that they'll bully or harass the new animal—in this case, they'll leave the animal in the cage for a few more days. Anderson monitors any aggressiveness among animals and counters this by feeding those individuals separately. No matter their size or personality, Anderson emphasizes that each animal in the tank is a priority, and says it's important not to take sides or favor certain animals. "It's hard not to pick favorites, but we try not to because we want to keep everyone healthy." 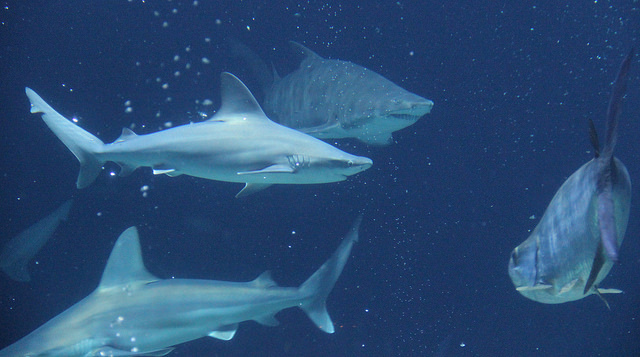 Images from the ABQ BioPark Shark Tank.